When we found out that our sweet two-week-old baby, Jett Lukas, definitely had T21, I was devastated. Between struggles with breastfeeding/weight gain and then the "doomsday" diagnosis, I cried through his first three weeks. From everything that I was reading, it was advised to let go of all the dreams that I didn't even realize that I had for my son. But I just couldn't! I couldn't imagine giving up on his future before it even started. When he was three months old, I meet an inspiring, helpful mom, Camille Gardiner (of Down Syndrome Foundation of Florida) and through her, discovered ways to help him: neurodevelopment, Targeted Nutrition Intervention and biomedical intervention through the Changing Minds Foundation, as well as an introduction to a great group of experienced parents/sister on the Einstein-Syndrome list. I am thrilled with the results from all their advice and research. 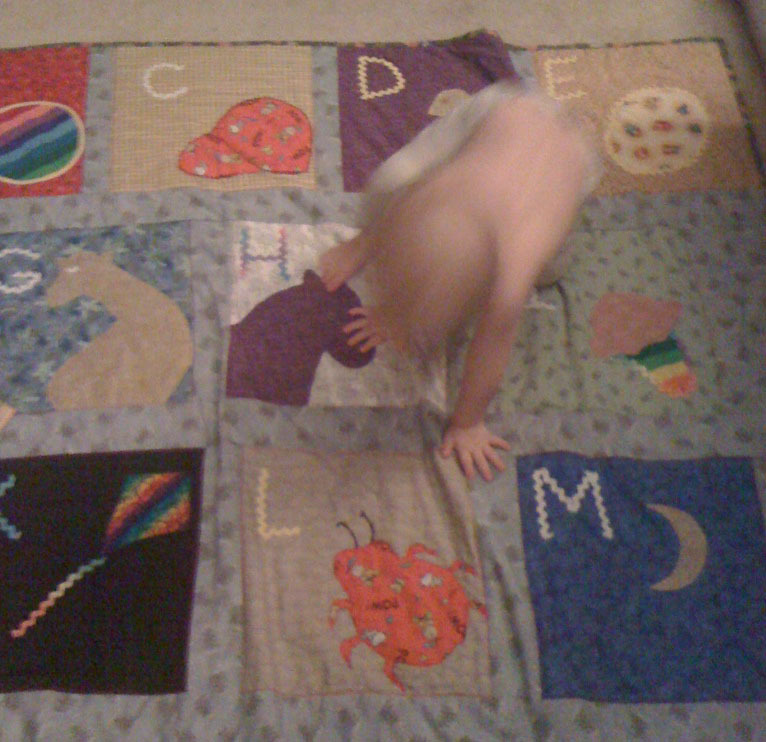 At 5 months, Jett first rolled over and was on target as far as milestones. He drank from a straw at almost 6 months, the day before his heart surgery. Because of surgery, his physical progress took a major set back. So, with a lot of neurodevelopmental therapy, he was army crawling by 10 months, creeping and pulling himself to stand at 13 months and beginning to cruise at 14 months. At the second evaluation after heart surgery with Jett's neurodevelopmentalist, Kay Ness of SENC, said he had gained 12 months of improvement in the 3 months since his last evaluation. At 11 months, he had his first speech evaluation with Renee Roy-Hill M.S., CCC-SLP of Talk Tools. She was amazed! She said that she had to evaluate him using the typical scale, not the one for children with DS. She said he was on par and above the typical child. He has no tongue protrusion, great lip closure, strong jaw muscles, etc. She said it was the easiest evaluation she'd ever done and had the least amount of suggestions. Two evaluations later, (another with Renee Hill and one with a local speech therapist) his speech is still on target. Just yesterday, he said: up, dirt, stuck (stup), daddy (he rarely says Mommy), kiss, shoulder (dol-der), I love you (Iwuv oo)... I'm sure there was more, but that's all I can remember. At 19 months old, he is learning to read lots of new words every day. He's basically obsessed with words and reading. He points to a word wherever he sees it and says, "What's this? or "What's that say?" (Wassatsay) His favorite book (today) is The Baby Goes Beep by Rebecca O'Connell, pictures by Ken Wilson-Max. Note: He looks at me when my husband writes, "hair" because I have very long hair. Jett is alert and curious. He can bounce to music, play ball with you, open drawers and take out the contents, can follow simple, one-step directions (touch all his major body parts, wiggle fingers, clap hands, sit up, get ball, come here, let go, give kiss, etc.). I can see him playing with more creativity and independence every day. It's a joy to witness his daily progress. I am grateful for Kay Ness, Teresa Cody and the amazing parents and family members who have helped along the way. I so appreciate what Camille did for me and my family that I have been inspired to follow her example by sharing what works for us with you. That's why, seven months ago, I started this blog. Our kids are full of potential! I wish you equal success with your loved one. Grammarly will donate $25 to the Yamini Foundation on my behalf. You too can make a difference. Visit WideAwake.org to learn how you can help. 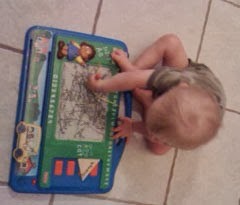 Jett loves writing on the magna doodle and he's been stealing our pens and pencils as well. Since I'm following his cues, I guess I need to get prepared to give him "safe" opportunities to write! How is writing more challenging for those with Down syndrome? And what can you do? Early on, I attended a seminar where they explained that, for those with DS, it was as if they had oven mitts for hands. Okay... but then they didn't tell you how to fix it! It's great to empathize, but please, let that be the beginning of the conversation, not the end of it! To fix this disadvantage, you must help your child to be able to FEEL his fingers and hands. When he can feel them, he can better use them! Kay Ness' Tactile Sequence will do the trick. Important play activities for developing handwriting skills are explained in this great blog post. Why teach handwriting in the computer age? ...Wendy Bounds discusses the fading art of handwriting, pointing out that new research shows it can benefit children's motor skills and their ability to compose ideas and achieve goals throughout life. ...Studies suggest there's real value in learning and maintaining this ancient skill, even as we increasingly communicate electronically via keyboards big and small. Indeed, technology often gets blamed for handwriting's demise. But in an interesting twist, new software for touch-screen devices, such as the iPad, is starting to reinvigorate the practice. ...Recent research illustrates how writing by hand engages the brain in learning. During one study at Indiana University published this year, researchers invited children to man a "spaceship," actually an MRI machine using a specialized scan called "functional" MRI that spots neural activity in the brain. The kids were shown letters before and after receiving different letter-learning instruction. In children who had practiced printing by hand, the neural activity was far more enhanced and "adult-like" than in those who had simply looked at letters. Even legible handwriting that's messy can have its own ramifications, says Steve Graham, professor of education at Vanderbilt University. He cites several studies indicating that good handwriting can take a generic classroom test score from the 50th percentile to the 84th percentile, while bad penmanship could tank it to the 16th. "There is a reader effect that is insidious," Dr. Graham says. "People judge the quality of your ideas based on your handwriting." ...In children who had practiced writing by hand, the scans showed heightened brain activity in a key area, circled on the image at right, indicating learning took place. 2) Acknowledge and praise the marks he can make, in whatever way he makes them. Many of our children will not be holding the marker in the "correct" way for some time. They need to go through a series of stages to get to the "tripod" stage where he'd be holding the pencil as you would. First, is fisted with elbow down, then is fisted with the the hand turned upside down and elbow up and then he'll be moving into the four-finger and thumb grasp and then to the tripod position. Each stage should be celebrated and none should be pushed upon him. Of course, Jett wanted to write perfect letters and words right away, but his short little fingers wouldn't cooperate. So my strategy was to distract him from feeling the need to write letters right away and to give positive feedback and a sense of accomplishment from making ANY marks that he can. Any mark that he made, I gave a name to so that it he got positive feedback and recognition. "Oh, I see: dots, dashes, lines and scribbles." That way each has a name and he can be proud that he can make those marks. 4) Move to more controlled dots, lines and circles with fun worksheets to encourage practice. We say, "Dot! Dot! Dot!" like we are so happy to do them. Then we've moved to more controlled dots, like "Ohhh, two dots up and two dots down!" and then lines from the top of the page to the bottom: "Line up, then down!" and then "Line, across, across!" Then we moved to "circles" which was basically anything round, which slowly became more distinguishable as a circle. To further reward him and have him feel pride for being able to do "just" lines, dots and circles, I found some free worksheets for him to do that give him a reason to practice and eventually perfect his lines and circles. See "Free Worksheets" below. 5) Continue to practice making more difficult, controlled writing tasks with worksheets that increase with difficulty. 6) A fun way he practices writing the letters in the air is when he watches the short, fun videos on youtube by Walphabet. You can find them on my youtube channel andiandi222 in the playlist called "Jett 32 months." He also practices and plays by writing letters in the sand and with chalk on the sidewalk. 7) If you are seeing frustration or just want more ways to improve handwriting without a writing implement, you can always do pre-writing/fine motor-strengthening exercises to give plenty of opportunities to hone the finger skills such as: bubble wrap popping, paper tearing, paper crumbling. 8) Once he was able to master those worksheets, we moved to a DVD I found at the library called Steps 4 Kids to Write Their ABCs . It takes each letter and puts them into groups of similar writing movements and walks you through each type of letter and how to do it on lined paper. Jett really enjoys the video (although it's not the least bit exciting, unless you love letters and writing like Jett does). We do one set of letters a day, about four, on one sheet of lined paper. I don't do more than that so that it's fresh for him everyday. a. We watch the video segment of one letter. b. He watches me do it on the paper in front of him. c. We do hand over hand practice. d. Then he does it on his own. Once we go through all the letters, first upper case, then lower case, then we'll go through them again until he has mastered them. For the worksheets, I bought a Crayola Dry Erase Activity Center which was $14.99 at Michaels, but I got it 50% off. The board works so that you can print any paper and slip it into the board then your child can use the dry erase markers all over it while still protecting the paper so you can reuse it or give it away when he's done with it. 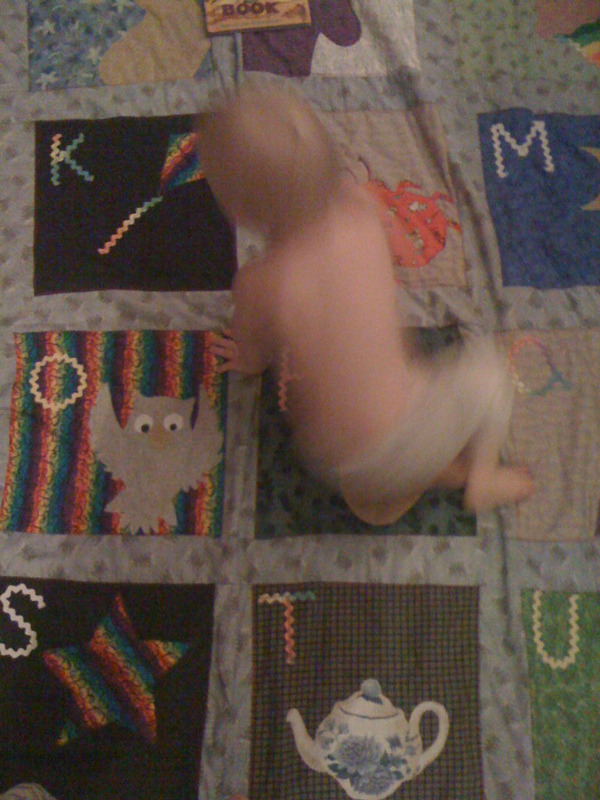 Jett used these sheets several times because it took him a while to be able to make a controlled, perfect line. Initially, Jett scribbled all over the page trying to control the pen and then progressively got better. The marker the comes with the center washes off hands and tables with water. For clothes, it's best to put on something you don't care about. Now, we buy the washable dry erase markers. They aren't as bright as the others but they work well and I feel better about him using them. These are the free worksheets that I printed out for him to practice lines, circles and x's. Be sure to only print the first page since the second page is often the unnecessary answer key. A cheaper alternative may be already printed activity books like the Sesame Street "Let's Learn the Alphabet & More" that you can get for $2.00 at Big Lots. They have four others to choose from and you can just rip out the pages and insert into the dry erase activity center. These worksheets are listed from easiest to hardest. Do just enough worksheets everyday so that he wants to do more and protests when you take them away. You don't want to bore your child. I don't let Jett do more than 3 a day. Tracing Straight Lines Worksheet Set 1 - Three worksheets include tracing straight lines from left to right, right to left, top to bottom, bottom to top, and slanted directional lines. Christmas Matching Worksheet- draw line between the word and the picture. Printable Christmas Picture Matching- draw a line between the matching pictures. Counting Crustaceans - Counting to 5. Dinosaur Tally - circle correct number of items, make "tally marks"
There are numerous, easy to find items to support this practice. One dry erase book we like is Wipe Clean Letters and Wipe Clean Numbers . For years Montessori teachers have used The Red Letter Alphabet Book as a complement to the Sandpaper Letters, integrating touch, sight, and sound to help children in the first stages of reading. This book uses greeting card felt (flocking) to make velvety, touch-sensitive letters, which invite children to touch and trace the shapes of the letters. Perhaps your local library or school has an elison machine that you can use to punch out the letters and shapes in the sandpaper. Fine Motor and Pre-writing Activities by a Montessori mom of a child with DS. The official Handwriting Without Tears website: An easy-to-teach, easy-to-learn curriculum makes handwriting mastery joyful for students and their teachers. These are cool because you can create your own worksheets. The writing space is too small for Jett at 2 1/2, but will be great when he's older. Yesterday, Jett got quite a treat! His grandmother gave him an alphabet tactile quilt that she designed and had been making for him for three years. 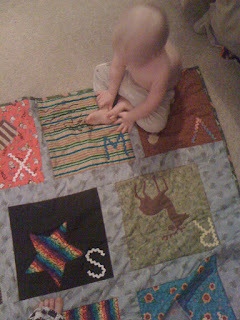 We spread it out on the floor and Jett went crazy with delight as he explored all the colorful ABC squares. 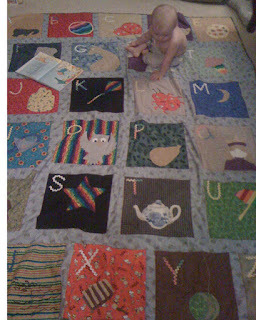 The letters are made of rickrack so they are raised and he can feel them. The net has a little net to play with, the yoyo has a string and the egg is puffy to the touch. My mother said that it was great to work on when she had a lot of nervous energy to expel while dealing with Jett's diagnosis. Jett, of course, loves it! So I thought I'd share it with you along with the instructions on how to make it. My mother said she learned a lot in the process. 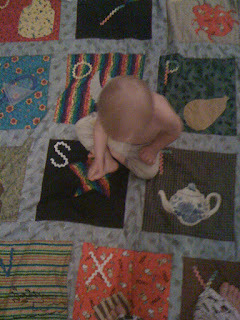 "Grammy's" instructions on how to make the quilt will be added soon. At 19 months old, Jett is interested in writing so having letters that are raised will help him get a better idea of how letters are formed. Our next project will be a tactile ABC book. Oxidative stress impairs the body's ability to readily detoxify offending substances such as free radicals or to easily repair the resulting damage. It is oxidative stress that is linked to atherosclerosis, cell aging and neurologic disorders in Down syndrome. On the other hand, glutathione is an powerful antioxidant. It helps remove free radicals and deal with oxidative stress. Studies show that levels of all forms of glutathione is low in children with Down syndrome. (And would make sense that it's low in adults as well.) This is caused by the overexpression of the SOD-1 gene. Studies show that supplementing with B12 and folic acid can help, but you may want to look into a more direct source of glutathione. This article was first published in the May 2004 issue of The Glutathione Report, a newsletter featuring regular updates on the health benefits of glutathione. Amyloid- peptide (A) accumulation in senile plaques, a pathological hallmark of Alzheimer's disease (AD), has been implicated in neuronal degeneration. Rice bran (tocotrienols) has glutathione peroxidase. It is also available in brown rice / whole grain rice, but not in white. “Brown rice is high in dietary fiber, vitamins, minerals, essential oils and protective antioxidants. Rice bran lowers high blood sugar and has been found to be one of the most nutrient dense substances ever studied. It contains over 70 antioxidants, protects against cellular damage, and preserves youthfulness. Rare forms of vitamin E that lower excess of fat and cholesterol have also been discovered in rice bran. It is also calming to the nervous system due to an abundance of B vitamins and trace minerals. Gamma-oryzanol is a rare and powerful antioxidant found only in rice bran. It strengthens muscles and converts fat into lean body mass. The antioxidant Alpha Lipoic Acid in brown rice promotes liver restoration, slows the aging process and converts glucose to energy. Glutathione peroxidase (GPx) is an enzyme antioxidant in rice that reduces mucous excesses, boosts respiratory function and helps detoxify the body. The CoQ10 it contains burns fat into energy helping you lose weight and protecting your heart. Unrefined rice also contains proanthocyanidins that are additionally protective against poisons and toxins in the blood, lymph and organ systems. In Lydia's Success Story, her mom, Jane, mentions using a high quality brand of glyconutrients as very beneficial for her daughter. Kristin Morrison of Naturally Better Kids also saw great results in her son, Gryffin when using glyconutrients. I've heard these same claims from several other mothers of children with DS. Meanwhile, there is no scientific evidence to back these claims. If I had more money, I would buy all these components and make the jam for Jett. Right now, I give him goji berry juice every morning (mixed with his 7 supplements that need to be taken on an empty stomach and preferable with juice), a little dulse (seaweed) mixed in all of his savory food, cooked mushrooms on occasion and a little Tupelo honey mixed with his more bitter supplements in the morning. (Honey is not recommended for babies under a year. Also watch out for yeast overgrowth & stop the honey if it's causing a problem.) I also reconstitute goji berries and give him 1/4 of a cup every two-three days. Next, I'll be getting an aloe plant since it has several of the beneficial ingredients in it. Here is product information, a recipe to make your own mixture and info about getting these same nutrients from food sources, including goji berries. "Glyco" is a Greek word that means sweet. So a glyconutrient is a "sweet nutrient" or a sugar nutrient. Of the 200 monosaccharides that are found naturally in plants there are at least eight essential monosaccharides (or simple sugars) that are not digested and burned as fuel - like how we think of most sugars. Instead this group of eight glyconutrients are structural building blocks incorporated as whole molecules directly into the cells within your body and are involved in a remarkable array of biological functions. These are functions that control everything from individual cell structure and function to cell-to-cell communication and protection for every single cell in the body. In 1996 the 24th edition of a medical textbook called Harpers Biochemistry first introduced us to this group of eight glyconutrients that are involved in the communication and inter-cellular function of virtually all cells of the body. What does this mean exactly? everything in the body depends to some level on these molecules. And it has been discovered that when they are missing it prohibits our immune systems from functioning at full capacity. Therefore science has established that glyconutritionals are not a diet option but rather a requirement for everyone just like water and vitamins and minerals or proteins and fatty acids. Let me break this down into everyday language for you. Let’s say that these miracle sugars are to the cells what the alphabet is to you and me. We rely on the 26 letters of the alphabet everyday to communicate with everyone around us. Similarly cells rely on glyconutrients to communicate with all the other cells in the body. What would happen if all of a sudden the alphabet was missing 5 letters? If we could no longer use the letters "G H N O and T" then a sentence as simple as "What are we going to have for dinner tonight" would no longer make sense to anyone. This sentence would now say "Wa are we i ave fr dier i?" Our communication system would break down by simply removing five letters from the alphabet. We would no longer be able to complete a major task in our everyday lives. The same holds true for cell-to-cell communication. Without all eight glyconutritionals in our system communication breaks down and allows disease to set in because the cells can no longer recognize the "good" from the "bad" and therefore can’t heal or correct or defend each other. All of these reasons have affects on each glyconutrient we get in our diets. What is amazing is that cells are preprogrammed to do what they do; they simply need the right raw materials to do it with. Glyconutrients have proven to be the missing links in restoring and maintaining health and do what no vitamin... mineral... amino acid... or herbal remedy can do. They help nourish and support every single cell in the body and allow your cells to clearly send and translate messages to each other and operate efficiently. Some moms purchase a product from newrootz.com. Newrootz has Super Glycoz, which provides 8 essential sugars, but is much cheaper than the brand that Jane used. The eight "essential" sugars are: mannose, glucose, galactose, xylose, N-acetylglucosamine, N-acetylgalactosamine, fucose (not to be confused with fructose), and N-acetylneuraminic acid. They are very important for health. I will not spend time dwelling on all the benefits as others have already done this in ample detail. In addition to the essential sugars, most of the ingredients in this recipe provide other health promoting properties as well. The aim here is to provide a simple and inexpensive way of getting glyconutrients. So let us now look at these eight sugars and see where we can get them from. Mannose may be the single most important of the eight sugars for us to get plenty of. One of the main sources is aloe vera, which contains acemannan. Acemannan is a mannose polysaccharide (i.e. a chain of mannose molecules). From what I've studied, most commercial supplements of aloe only have very small amounts of acemannan in them so the best way is to grow the aloe vera oneself. It is a very handy herb to have in the garden or green house (e.g. good for minor burns and some skin ailments) and it is easy to cultivate. Consult a gardening book, but apparently it needs a sunny spot that's not too moist. I may want to enjoy using plenty of it, so ideally would like to invest in about ten plants. While I am waiting to buy and establish my own aloe plants I can use the glyconutrient powder which does have mannose in as well. This is from the kelp, the shiitake and the ground fenugreek. I have actually recently decided to just take the glyconutrient powder (as detailed below) because I find it easier. Fenugreek contains plenty of galactomamman, a polysaccharide of mannose and galactose (other sources of galactomamman are carob gum and guar gum). Ground fenugreek should be readily available from a good health food store or supermarket, or I can buy the seeds and grind them myself. I prefer organic fenugreek. Shiitake mushrooms have in them a compound called KS-2 which contains mannose bound to an amino acid. We will say more about shiitake (and kelp) later. Using fenugreek, kelp and shiitake should not be very expensive. Aloe vera plants may be expensive to start with, but a friend may have a "jungle" of the plants and be able to give some. Regarding the powder, glucose is found in kelp. But we don't really need to supplement glucose as it's so abundant in our diets anyway. For the "jam" recipe the prime source is 100% pure grape juice, preferably dark organic (but I don't worry if it's not feasible). The grape juice will help, along with the next item, to make the aloe vera taste yummy instead of yuck. This juice is relatively cheap and if you have a juicer you can make your own. Galactose is present in the fenugreek of the powder and also in a lot of foods that we normally eat. For the "jam" recipe the prime source is 100% pure apple juice, preferably organic. This juice will help, along with the previous item, to make the aloe vera taste yummy. Both apple and grape juice have health properties of their own. Again this juice is relatively cheap and those with juicers can make their own. (It's best to make your own because commercial brands have been found to have arsenic in it.-Andi) Some analysis don't report galactose as being in apple juice. This is because the galactose is in the pectin fiber which is present in varying amounts in juice. Xylose is present in the kelp used in the powder. Ground psyllium seeds are high in a xylose polysaccharide. They are cheap and easily obtained from a chemist or health food store. Psyllium is used in the "jam". 5 and 6. N-acetylglucosamine and N-acetyl-galactosamine. For those not wishing to consume medicinal animal products orally it is nice to know that Shiitake Mushroom contains N-acetylglucosamine (as a constituent of chitin). I can purchase fresh and/or dried Shiitake Mushrooms from many supermarkets and food stores. I buy dried whole shiitake mushrooms and powder them by using my liquidiser. Or I can buy a tablet with shiitake in. Shiitake Mushrooms do not contain N-acetyl-galactosamine. I thought that mistletoe contained N-acetyl-galactosamine but it appears that it does not. Instead it seems to contain a lectin that is specific for the N-acetyl-galactosamine receptor site. Also there are some toxicity issues with mistletoe. N-acetyl-galactosamine is contained in dextran sulphate, which is present in a red algae called Dumontiaceae. But this product is only available from Japan as far as I know. Update: but appears to also be available from www.herpes.com/qc/purchaseform_qc.shtml. Also received this message from someone: "A source for Dumontiaceae: www.dynamune.com/#RMA This is the only place I found a bulk powder (250g for $40)". Bovine cartilage and shark cartilage both have an abundance of these two essential sugars. These are both relatively cheap and available from a chemist or health food stores in capsules or loose powder. I prefer the bovine cartilage because it is predominantly the chondroitin 4-Sulfate form of chondroitin which is apparently slightly better (shark is predominantly chondroitin 6-Sulfate). I am not especially concerned about prions and [BSE] from a bovine source because I can check where the cows come from and cartilage is not one of the tissues especially at risk for prion contamination. Actually, from what I've read, chondroitin is a substance that can be used to help treat prion disease as it interferes with the prions doing their dirty work in the nervous tissue. I am more concerned about the possibility of heavy metal contamination in shark cartilage, though I have not read any major problems regarding this. Those not wishing to consume animal products orally could use an arthritis cream containing chondroitin sulphate. The best cream I know of is Arthro-Aid Direct, which should be rubbed on the tummy at the time the glyconutrient powder is consumed. Kelp seaweed is rich in fucoidan, a polysaccharide containing plenty of fucose. Fucoidin is a complicated molecule that also contains xylose, mannose, galactose, and glucose. If anyone has an overactive thyroid they should not take this or other sea weeds without medical advice and monitoring. An alternative is beer yeast, which, according to my research, also contains plenty of fucose. Kelp has many health benefits and can be bought cheaply as a powder. It does not taste good to me! Compare Seaweed. allergic to diary can take the isolate) an alternative is egg, which may be best raw. I need to make sure it is an organic egg from a healthy chicken. I need to make sure I buy whey protein ISOLATE, not just whey protein or whey powder. A 500g pot of whey protein isolate is a little costly but will last a long time and so is not a big expense long term. Note: I received some information early 2004 that suggested whey protein concentrate may have a higher amount of N-acetylneuraminic acid in it than the isolate. 2. The glyconutrient jam which, if made correctly, tastes yummy and which is designed to give large amounts of the key monosaccharide mannose. • 1 part ground fenugreek: mannose, galactose (buy it already ground). • 1 part shiitake mushroom powder: N-acetylglucosamine, mannose. • 1 part kelp powder: fucose, xylose, mannose, galactose, and glucose. • 1 part whey protein isolate: N-acetylneuraminic acid. Alternative is beer or brewing yeast. • 1 part bovine or shark cartilage chondroitin sulphate powder (loose or in capsules): N-acetylglucosamine, N-acetylgalactosamine). Alternative is Dumontiaceae (www.dynamune.com/#RMA) for the N-acetylgalactosamine. • 1/2 part of ground psyllium (or the husks alone would probably do) to boost the xylose content as there is not that much xylose in kelp. You can mix all powders together along with a little red cayenne pepper powder and a little turmeric powder too (unless you are already using longvida curcumin). Cayenne may enhance digestion and is an extra tonic (1/10-1/20th part). Turmeric has antioxidant properties. You can add 1 part of lecithin granules as it supposedly enhances absorption of glyconutrients. You can mix about 1 heaping tsp of the mixture in about 50-ml of cold beverage and drinking it down quickly at the beginning of breakfast, lunch and sometimes also the evening meal. You could use more if you were ill with some major complaint. Alternatively, I could take it with yogurt etc. or put the powder into "OO" size vegetable capsules to consume. Ideally, I would take five size "OO" capsules twice a day before meals. An alternative, if I wished to avoid mixing powders, would be to take one "OO" capsule of each powder twice a day before meals. Thirdly, you could take your powder mixed with an equal amount of honey. It seems that some in Australia may be having difficulty tracking down some of these ingredients, which is a surprise. So as a service to Aussie folk and NZ researchers* if you want some more tips. Also click on [the same] link for a suggestion I have found good regarding taste! Whey protein isolate can be taken "sublingually" in small amounts too. I am told that this is an even better way of taking it. But it can take awhile to "dissolve". Kelp in particular does not taste good to me. However, I have found it OK to take as part of the powder in the water at meals. Also a teaspoon of kelp powder plus some cayenne did not taste too bad to me when I tried mixing it with a heaped teaspoon of honey. Having said that kelp doesn’t taste good, my two-year-old daughter asked for some when she saw me experimenting with it at the table. Despite my warning she still wanted some and so I gave her a bit on the tip of a spoon. To my surprise, she actually wanted more! Honey occasionally contains spores of Clostridium botulinum - the Detrimental Bacteria that can cause the type of food poisoning called Botulism. For this reason, honey should not be fed to children under 12 months old. Kelp and Wakame seaweeds (Asian style), shiitake, fenugreek and whey isolate are all foods that can simply be eaten as part of a meal. There should be a good way of having all these items at a meal say twice a week using for example, wakame, fenugreek, shiitake, rice and vegetables with whey isolate mixed with dates and soy yoghurt for dessert. We need some good chief to come up with a tasty recipe for us to use! Have this meal with a chondroitin sulphate capsule and you've got all 8 sugars! Slowly simmer (don’t boil) 1 litre grape juice and 1.5 litres of apple juice so that half the water evaporates. Before turning off the heat stir in about 1/4 cup of ground psyllium. IMPORTANT: MAKE SURE NOT TO PUT IN TOO MUCH PSYLLIUM AS IT WILL TURN INTO A SOLID JELLY THAT IS NO GOOD FOR MIXING THINGS WITH. I err on the side of too little psyllium then add more if needed. Keep stirring for a couple of minutes or so then turn off the heat and let it sit. It will turn into a kind of jelly that tastes like jam. The heat should help to break down the psyllium polysaccharide into the xylose molecules. Store in a jar in the fridge. When I wish to take my glyconutrient jam I put 1/4-1/3 of a cup of the grape, apple and psyllium jelly into a container. I grab about 4-5cm of an average aloe vera leaf from my garden and using a pair of scissors or knife chop it into the jam. Note: aloe contains a laxative so diarrhea is a sign that I am taking too much. If you get diarrhea (from the yellow aloin just under the skin) then try scraping out and eating just the gel. I stir the aloe bits in and then eat it with a spoon. The aloe and jam should taste nice, but if not happy I can try cutting the aloe vera into smaller pieces or liquidising it into the jam. This further improves taste but ends up taking more time, especially to clean up! The aloe vera needs consuming soon after picking and chopping as I am told aloe vera’s mannose is quickly damaged or degraded after a leaf is picked. The glyco-jam is easiest taken as a kind of entrée 10-30 minutes before meals or on its own as a supper in the evening. I aim, for maintenance, to take this mixture three times a week or daily. For nutritional support when ill I could be take it more frequently.